Really like David Montgomery. Was a workhorse for Iowa State. Not the flashiest, fastest guy but runs hard and gets a lot of yards after contact. Parris Campbell reportedly visiting the Cincinnati Bengals today, while several other Ohio State draft hopefuls are also in Cincinnati for the Bengals' local pro day, including Johnnie Dixon, Dante Booker, Demetrius Knox, Malcolm Pridgeon and Sean Nuernberger. Why is the other thread locked? Because... it’s Locked on Bengals! 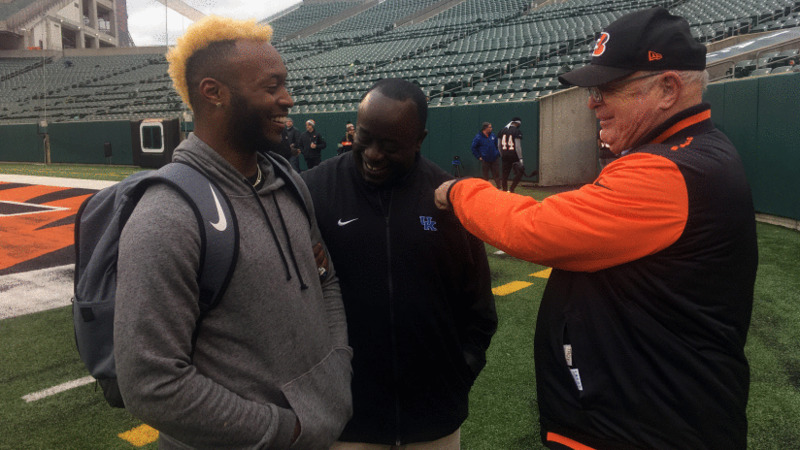 Bengals president Mike Brown (right) greets Kentucky safety Mike Edwards as Ray Oliver looks on. Isn’t it late Speaker of the House Tip O'Neill who came up with “all politics is local?” But isn’t all football local, too? For Mike Edwards, it turns out to be not all that different from the early days growing up on Cincinnati’s western edge. His father drops him off and his sister picks him up. 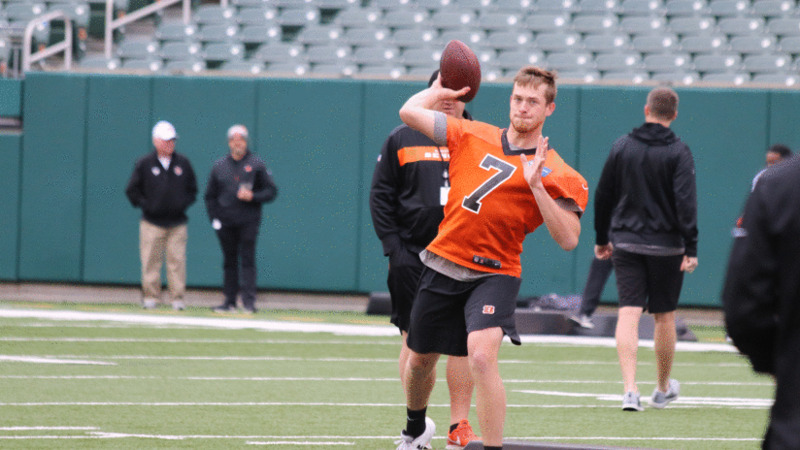 Except this time it is Monday at Paul Brown Stadium for the local pro day, where the Bengals take the session to peruse prospects that played high school and/or college in the city’s metro area. And his sister doesn’t drive him home. She takes him to the airport for his flight to New York and visit with the Giants, one of those interviews befitting a prospect worthy of a pick in the first three rounds of the draft or a free-agent contract after the draft. But there’s no question that Edwards, the 5-11, 200-pound safety that helps lift the University of Kentucky from the doldrums to the fruits of a Citrus Bowl victory over Penn State, is getting drafted. Probably a week from Friday night during the second and third rounds. Oliver is a bluegrass icon known as “Rock,” who chiseled basketball greats from Jamal Mashburn to Karl- Anthony Townes in the Wildcats weight room. 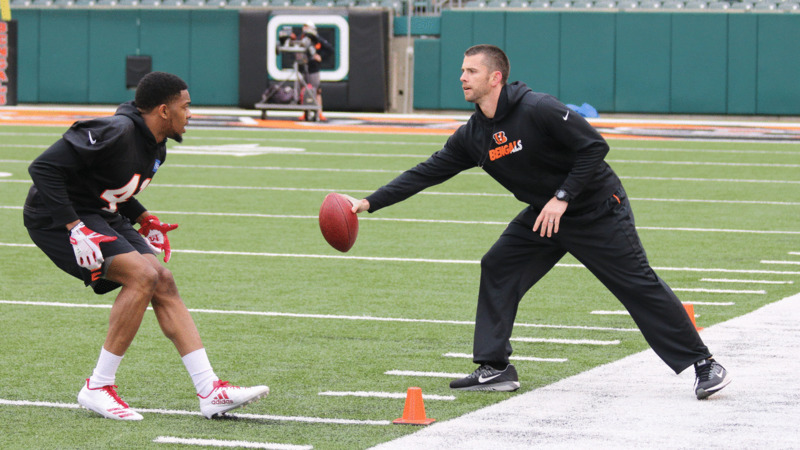 To knowledgeable Bengals fans, he is Chip Morton’s assistant strength coach in the PBS weight room from 2004-09 that helped head coach Marvin Lewis change the culture with their first two AFC North flags. On Monday, he is a mentor to Edwards as an associate athletic director at Kentucky whose strength of experience and wisdom has taken him into the halls of power. He’s got a good idea what works for a draft prospect since he’s been on both sides of the glass. On this day, he is also part of a discussion on the PBS sidelines with three Cincinnati guys as Oliver, who grew up hard in the West End of the late ’60 and ‘70s, introduces Edwards, the latest in a long line of Winton Woods High School players that have dominated the Cincy prep scene during the 21st century, to Bengals president Mike Brown. “Best boss I ever had,” says Oliver to Edwards, who may or may not know he’s also worked for Rick Pitino and John Calipari. “Nice to meet you Mike. You played at Winton Woods, right?” Brown says with hand extended. Edwards, whose mother works at Children’s Hospital and whose father is a barber in Tri-County, is Cincy through and through. He’s been here before. His father is a Broncos fan, so he is, too. He was at PBS on the Monday night Bengals wide receiver Chad Johnson smoked Denver Hall-of-Fame cornerback Champ Bailey on two bombs and five years later when Denver wide receiver Brandon Stokley stunned the Bengals on an 87-yard TD with 11 seconds left in the ’09 opener. New linebackers coach Tem Lukabu works the local pro day. “That was crazy,” Edwards says. After some football talk, Brown turns to Oliver and says, “The ageless one,” before going through the eternal rite of pre-draft picking of the brain. At 57, Oliver, still fire hydrant strong, embraces the exercise and runs through the Kentucky players back home for Brown. He looks at Edwards in street clothes slinging a back pack instead of a helmet and can’t really blame the guy for not suiting up and standing by his workout in Lexington that included a 40-yard dash in the 4.4-4.5-second range with a 37-inch vertical leap. 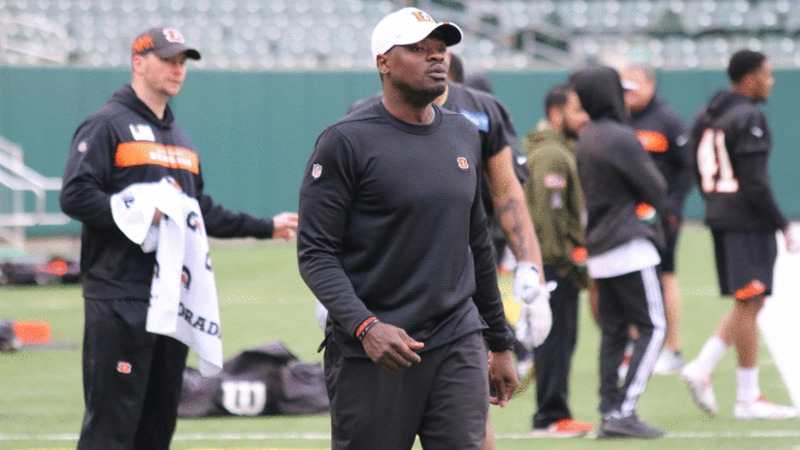 Plus, a sit-down with Bengals safeties coach Robert Livingston in his office figures to be more valuable for both. “The only people who know if you should come out are in the NFL. Nobody else. They know,” Oliver says. “If you want to know if you can be an astronaut, you don’t go to Disneyland and ask Mickey Mouse. You go to NASA. Like all good coaches and administrators, Oliver spends his days repelling bull and distilling reality. His advice to a draft prospect is as stark as a 40 time. “You better be better than everybody around you if you’re going to play in this league,” Oliver says. “Just because you played that’s not good enough. I think some people believe since they started in the Big Ten or the Big 12 or the SEC, that’s enough. No, you have to be really good. University of Cincinnati quarterback Hayden Moore lets it fly. Oliver has also been in a Mike Brown draft room, now run by director of player personnel Duke Tobin. Oliver’s draft room had a young Tobin as well as Lewis and future head coaches such as Hue Jackson and Mike Zimmer, so he can tell his kids what the pros seek. Oliver has a quick introduction to new head coach Zac Taylor, a reminder that the only guys left with whom he worked are punter Kevin Huber and long snapper Clark Harris and their coach, special teams coordinator Darrin Simmons. He does see a familiar face in Tobin and that brings him back some. It’s just another form of cutting through the bull. Oliver is thinking back to the best part of his visit. A meeting of three Cincinnati football guys on a chilly hands-in-the-pocket spring sideline.